Here we are once more with me, GLN's roving reporter Herald O. Riviera, with another in GLN's series of interviews with the people who are the heart and soul of Blood Bowl. 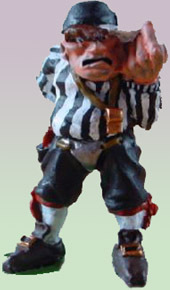 We have already met bootstudder Halfmoon Proudfoot and referee Hubert Hornblower, and today we're going to do something a little different... we;re not talking to anyone inside the ground, but a member of one of the most important groups in Blood Bowl: the street vendor. The subject of our interview this issue is Smiffy the Spruiker, one of the most successful purveyors of sporting memorabilia and merchandise in the business. His background is shrouded in mystery, suffice to say that he comes from a little-known part of Brettonia where the people have been so far removed from the wider world that their speech patterns have devolved back to more primitive states. Thus he speaks in a dialect peculiar to his native region, which is called Khoknee, situated next to a peculiarly-coloured lake called the Pool Of Liver. Smiffy is not the most well-known export of Khoknee (that being a rather fleshy-looking musical troupe called the Meatles) but like all of his brethren he retains a sunny disposition and a charming personality, even if you can't understand what he's saying half the time. We stopped by his stand before a big game to ask his thoughts on the Blood Bowl phenomenon. GLN: Hello Smiffy... may I call you Smiffy, or is it Mr Spruiker? StS: Wotcher guv! You looking to shell out some clams for some gear, squire? GLN: I beg your pardon? StS: I'm seeing iffen you're in the market for a bit of the other, know what I mean? StS: Ohhhh, Gordon Bennet! Now I remember, they said there was some poncin' little toffee-nosed geezer coming down to bend me shell-like. What can I do you for? GLN: I'd like to ask a few questions. First, why are you called Smiffy the Spruiker? StS: Well, see, me monicker is Smiffy, and spruiking is wot I does, mate. Spruiking is wot I was just doing a second ago til you poked your hooter in, asking geezers if they want to buy any of the special little items I've got on sale 'ere. GLN: How have you been going at the sale game lately? StS: I'm knackered mate! It's been chockers all day. There's all these new races in Blood Bowl, and all the fans are flocking to see if they can cut it wiv the bovver boys in the open divisions. It's a nice little earner! GLN: I see. So what are the fans buying a lot of at the moment? StS: Well, I'm clearing out banners for the new Elf teams like they're going out of fashion. Matter of fact, fashion is all that the fans look for from those Elves... they don't worry about goin' the biff on the opposition, it's all blimmin' hair products and facial cream with those jammy gits. I'm selling out of handkerchiefs at their games. GLN: How about the new types of undead teams? The Khemri, for example? StS: Bleedin' disaster, mate. The lifeless sods aren't much chop in the way of merchandising opportunities. I mean, how can you sell authentic replica uniforms for a team that is full of skeletons who don't wear any flippin' clothes? The only joy I'm getting out of the Khemri team is selling hospital gauze so all the fans can wrap themselves up to look like the mummies. GLN: What about the Necromantics? StS: That's a bit better. Them werewolves is popular with the punters, especially when they forget about the ball and start slittin' up some poor blokes like they was tissue paper. I've had a lot of success selling fake claws so the fans can practise their disembowelling skills, and there has even been some sales of green face paint amongst some shifty lookin' geezers who are into that whole zombie scene. Still, each to their own, eh guvnor! GLN: Quite. How has the recent news about the Vampire teams in Blood Bowl affected business? StS: Oh blimey, it's been a bloodbath, squire. I used to have hordes of beautiful girls here every week following vamp teams, wanting to buy flavoured creams to apply to their necks to make them more attractive to their idols, or girly magazines giving the latest details of who's been biting whom. They were ponying up the dosh every week for that stuff, just so they could try to be the first amongst their friends to be sucked by their very own batman. Now the vamps seem to have lost their appeal. I think it's something to do with their eyes... they don't seem so bloodshot any more. I even get some of the players stopping by these days on the quiet to buy books on how to hypnotise people. They seem to think they've lost their bottle! The only girls who turn up to their games these days are right old slappers, let me tell you. GLN: From what I can see of your stand, you seem to be having a clearance sale of some sort. Is there a certain range of items which aren't very popular any more? StS: Larks-a-lawdy, you've hit the nail on the head, guv. I can't shift a single unit of gear for minotaurs and rat ogres any more. For some reason, the fans have gone right off them. Mind you, I can see why... they've suddenly started acting like little crybabies on the field. I used to sell heaps and heaps of mino masks and rat ogre tails for the kiddies to wear, so they could pretend they were the ones out on the field bashing up the elves, but now they're sitting on the shelf there like shags on a rock. I did have a bit of success with a line of huge novelty baby dummies, but the fans have tired of even that after one of them got shoved down its owner's throat by a particularly angry mino who decided to stop roaring for a while. Crikey, it was a bugger of a job getting the mino calmed down after that! I've also started selling some air deodorisers, because I don't know if you know anything about what minotaurs and rat ogres eat before the game, but their breath stinks to high heaven and all that roaring can make the air rather muggy after a while. GLN: How distatsteful. I suppose we should end the interview on that note. Anything you would like to say to the Blood Bowl fans out there? StS: Bloody oath! Come down to Smiffy the Spruiker's Super-Mart! We've got everything a true Blood Bowl fan could need! Just look for our tent on your way to the stadium! GLN: Yes yes, that's enough blatant self-promotion. Good day to you, and be with us next issue when we interview another quiet achiever of Blood Bowl. Herald O. Riviera reporting for GLN.